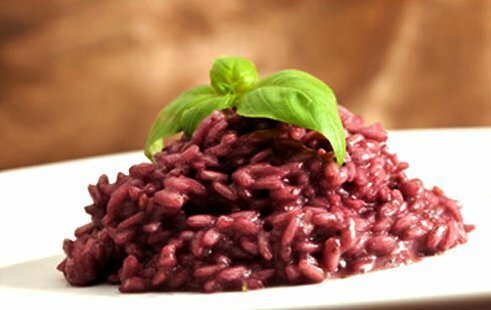 Risotto with Amarone is one of the most popular dishes of the Veronese culinary tradition, the cutting edge of many renowned restaurants in the city. In it are combined three of the products of excellence of the territory: Amarone della Valpolicella, Vialone Nano rice and cheese Monte Veronese. Cheese Monte Veronese or grated grana padano. Beef marrow or, Alternatively, extra virgin olive oil. 1/2 bottle of Amarone of Valpolicella Brothers Vogadori. Heat the Amarone. In a saucepan with half the butter, marrow, or the oil, brown the onion. When the onion gets golden brown, add the rice and toast over medium heat for a few minutes while continuing to stir vigorously. Salt and pepper lightly. Slowly add the Amarone. Complete the cooking over high heat, adding the hot stock a little at a time as you consume and stirring constantly with a wooden spoon. Add salt if necessary. Cooking depends on taste, but the grain should maintain a certain consistency. Turn off the heat and stir vigorously stirring and adding the remaining butter and the grated Monte Veronese. Many could cry her heart to use the “precious” Amarone as a cooking wine. At first glimpse, however, you will understand that it is worth it.